Another week, another shirt. 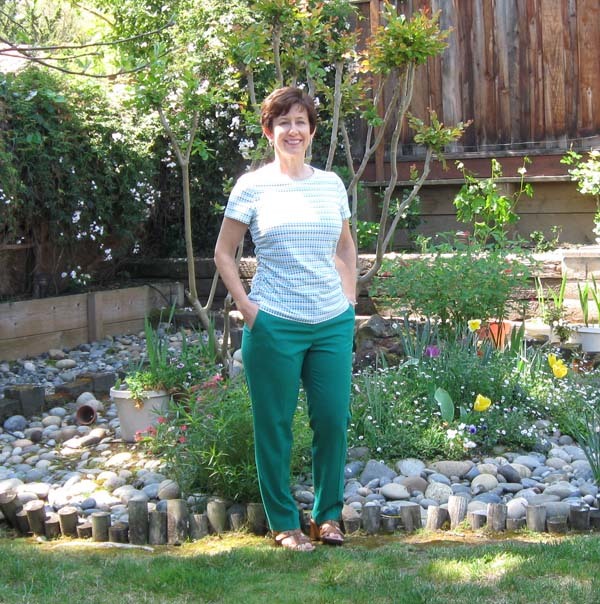 I have resisted adding more dresses to my overflowing wardrobe and made another shirt using Simplicity 2339. This shirt was completed about two weeks ago and I haven't had a chance to post since - although happily I did wear it twice. The fabric is a nice weight of cotton poplin with a touch of lycra. I confess I mostly reach for woven items that have lycra these days, whether pants, shirts or skirts, that lycra makes them so comfortable and reduces the wrinkling to an amazing degree. Today will be a very lazy day, as I have just returned from a business trip to Philadelphia (2nd time there in 4 months) and brought back with me a very severe cold and sore throat. Anyone else dread the airplane germ? I am likely to get sick after airplane travel - probably about 20% of the time. Not a tragedy on the return trip but so aggravating on the outbound direction, I have sniffled through a tropical vacay and frequented the various European pharmacies seeking all kinds of over the counter remedies. Anyway - it is raining today (!!! my garden is so happy) so it's a good day to lay on the couch, catch up on my tivo recordings and do some sewing planning and organization. I have been woefully slow with a new Pattern Whisperer post. 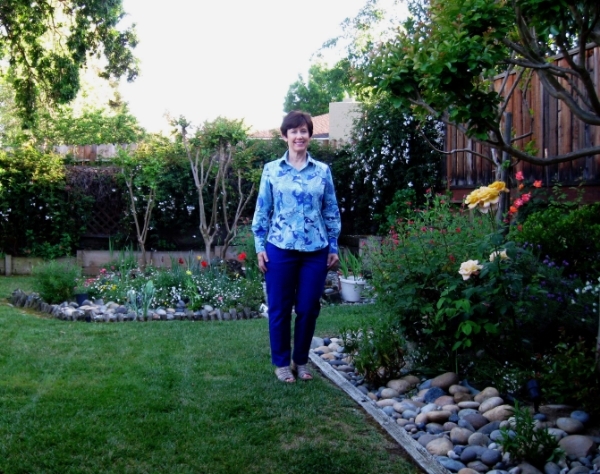 What should I tackle now that spring is here? Dresses? Perhaps knit tops? I think I will put both in the works. This fabric might be too much for those of you who shy away from wild prints or colors but it fits into my bright wardrobe. Now that it is complete I see that I need a turquoise denim skirt and have a scrap remaining from another project that is hopefully just enough for Vogue 1247. At this point I don't have too much to say about this pattern. 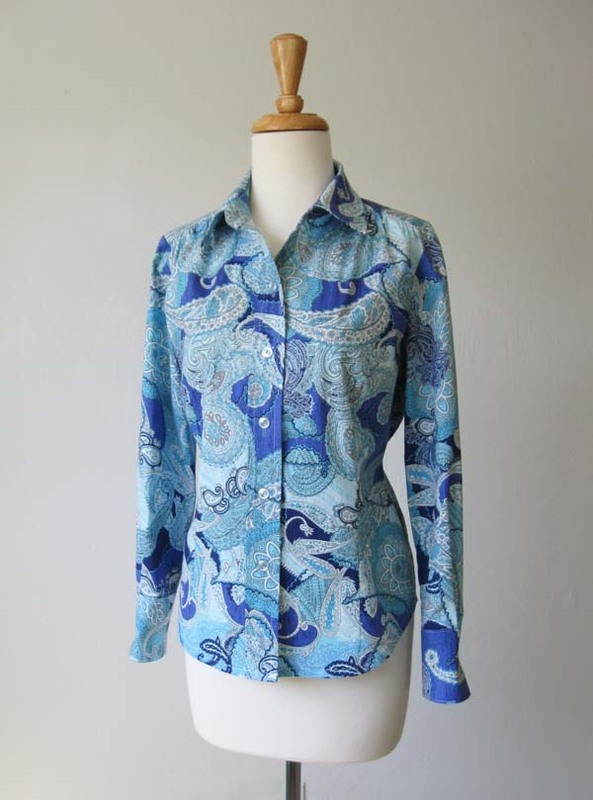 It is a basic collared shirt that is adaptable to a variety of fabrics. A Simplicity Amazing Fit pattern which means it comes with the various cup sizes although it is not very fitted. Most times I change the hem to a curved shirttail hem, and change up the placket. 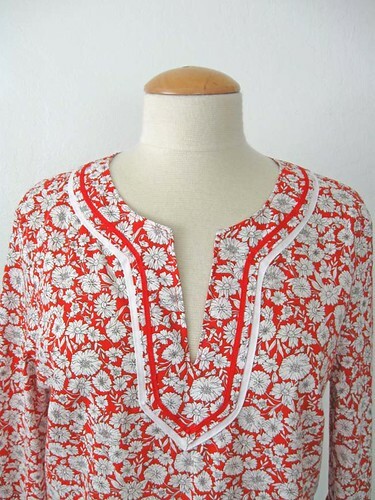 In fact I have never made it as the pattern comes, with the sewn on button placket. 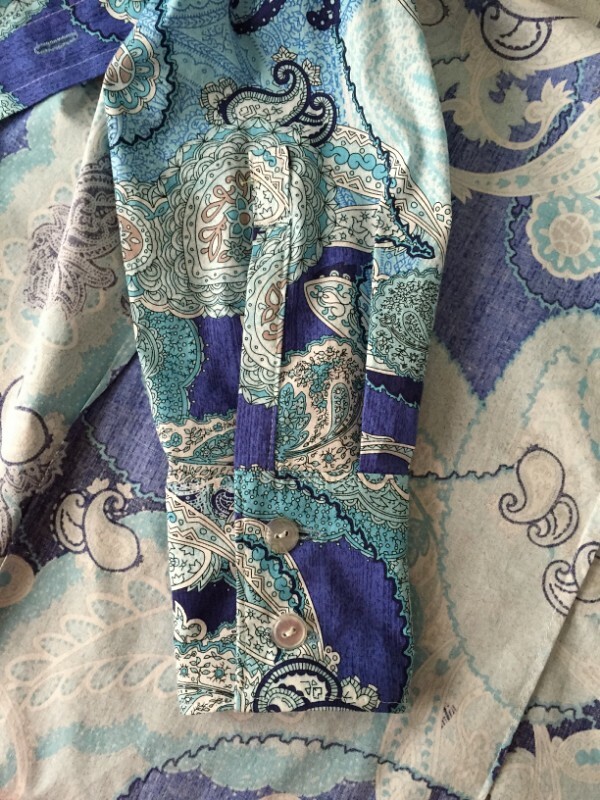 First time in silk charmeuse I made a hidden buttonhole placket and then the other times I have made what I call a "one-piece cut-on placket. Which is a name I made up, not sure if it has an official title, but the shirt front is extended at the center front line to incorporate the fabric that would be in the placket, folded back to make the stitched tuck where the edge of the fabric is enclosed. I keep planning to show how I do this. It involves some measuring and three-dimensional thinking (what else is new in sewing, right?) but the result is a super clean finish with no bulk. Very ready-to-wear which is actually how I had the idea. Do you like that crisp collar and stand? I think this is my most Pinterest-ed post from this blog, the method to do the collar and stand. I use this every time and really like the way it turns out, plus the juncture of the shirt top and the bottom of the collar stand is not bulky as it can be using other methods. Another change in this shirt is that I rotated the side bust dart into shoulder gathers. 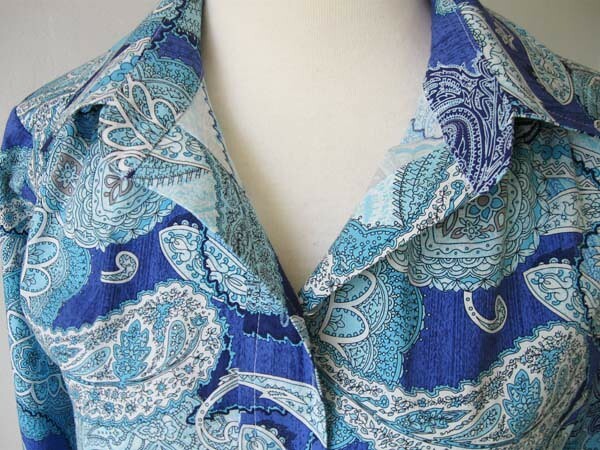 In cottons or silk this turns out so well and would be great for a plaid so that you don't have to worry about difficulty in matching on the side seams. 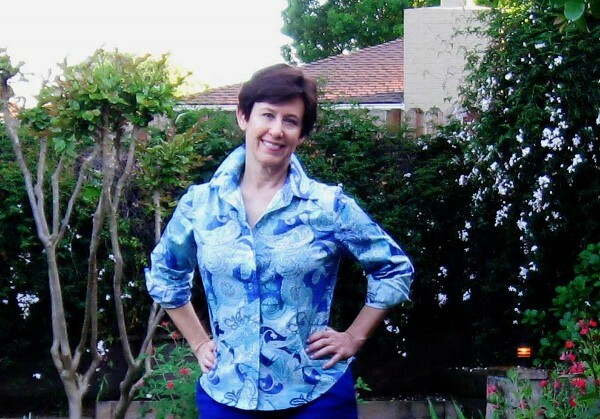 Last year I watched the Craftsy class, One Pattern, Many Looks: Blouses and I highly recommend it. The instructor has a very good teaching style, I got a lot of new-to-me tips and if you are interested in pattern drafting but don't want to start from the sloper but instead see how to manipulate existing patterns this is a great class. I did this Craftsy post last summer on the dart manipulation. this is probably how I will wear this shirt, with sleeves rolled up. For that reason I like to make the tower placket a bit long, or as least as long as the cuff so that it is easy to roll up. And in this instance I finally shortened the sleeves, which were too long in my last version of this shirt. However I might have taken away too much (two inches) so I had to make a slightly bigger cuff. Note for next time! Ok and now a final view - what a dork! Why am I standing like that? and the shirt is buttoned slightly wonky so the bottom is uneven. But it matches my new pants perfectly :) Purchased pants - oh how happy buying pants makes me - no fitting required. But always hemming. So that's the latest around here. Feast your eyes on all that greenery, my lovely roses are in full bloom, the pink jasmine is wafting a gorgeous scent across the yard and a few tulips are still blooming. I just bought some more drought tolerant plants yesterday so hopefully things will keep looking good through the dry months ahead. Time to curl up on the couch with my box of kleenex and another cup of coffee. I always think the idea of tea sounds so nice, especially when you are sick, but I confess, to my tastebuds, tea is yuck! Coffee is my beverage of choice, and in any mode, candy, ice cream, cookies, whatever. Coffee is as essential as water to me. 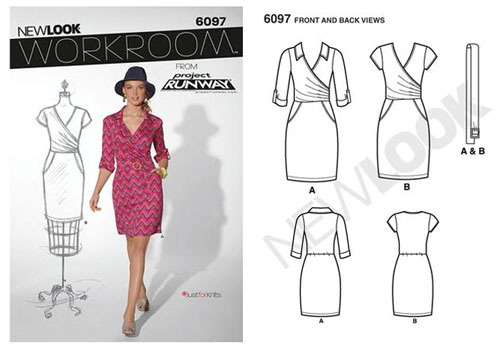 Up next, finish the New Look dress mentioned a few weeks ago and then I will start in on some of the new patterns I have accumulated. I even bought one yesterday, Vogue 1448 . The pattern suggests silk, voile, matte jersey so a lot of possibilities. I does take 3 or 4 yards which is quite a bit for a sleeveless knee length dress so time to dive into my fabric closet and see what is available. By the way, if you would like to see the other versions of this pattern I have sewn here are the links. Hey I sewed up a new pattern! To be precise, a not so old pattern. I think it was the McCalls release previous to the most recent one, and I bought it on impulse. Actually I tried to improvise this ruched side seam t-shirt a while ago and the result was ok, but sometimes it is so nice and simple to buy the exact pattern. I am really happy that I tried this pattern. Kind of cute, huh? I got this knit fabric at a Bay area Sewist Meetup group a few months ago, so basically free. Not sure what is the fabric composition but it feels like 100% cotton interlock knit. 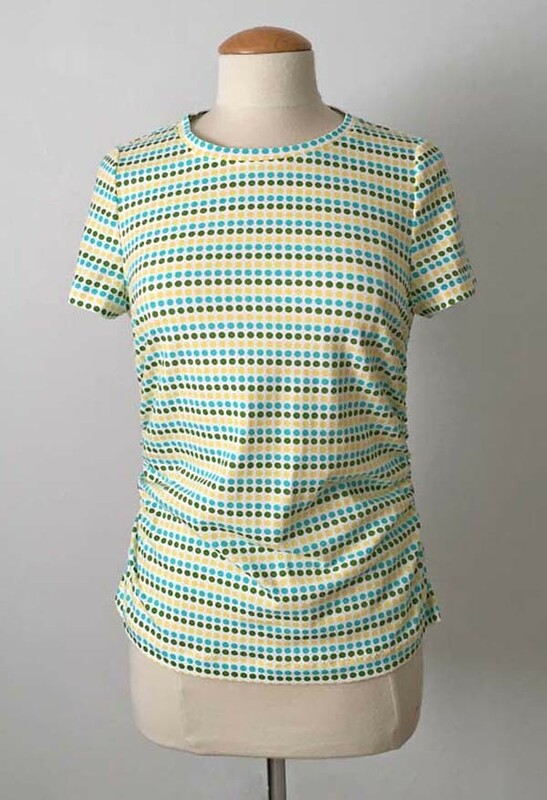 I don't recall what the neck finish was on the pattern instructions (because I never follow them) but for a cotton interlock t-shirt I think the neckline band finish looks the best. In this old post about t-shirts there is a link to a video on the Threads magazine site that explains it so clearly. 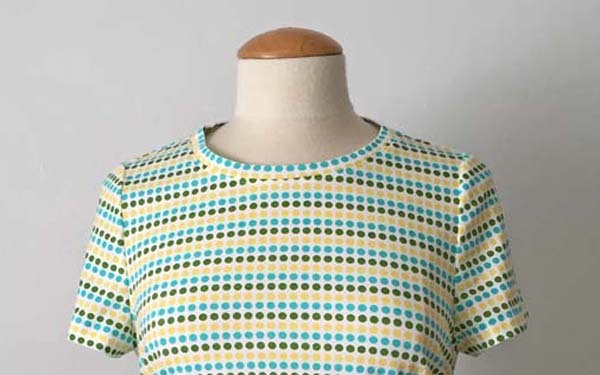 The stripe looks a bit swoopy in the center top but it doesn't seem that way when worn, I think it is a slight optical illusion of the dotty stripe. Now with this close up of the top do you see my slight mistake? I was trying very hard to match the stripes for the sleeves, and using the aqua row as my match line, but obviously not paying attention otherwise as the fabric is upside down on the sleeves. But I never even noticed until I looked at this photo. So hopefully not really noticeable. Here is the pattern envelope, with a print mostly obscuring the pattern detail, of course! and the drawing. 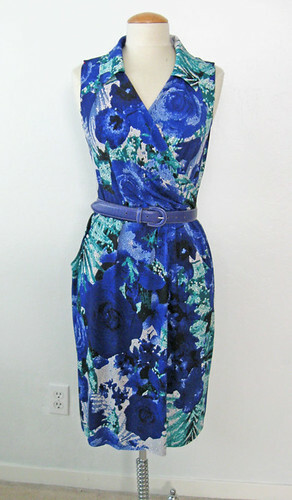 The more I look at it the more I like the dress version with the single layer ruffle skirt - but sleeveless for summer. I have some oddball knit jersey that might be just right for this. Super simple pattern and some interesting details about the fit. I rarely make McCalls patterns but every once in a while. The only other knit top I have made with McCalls is this one which I have made three times. It is kind of big in the size 12, I had to take it up at the shoulders to get it to fit so very roomy. 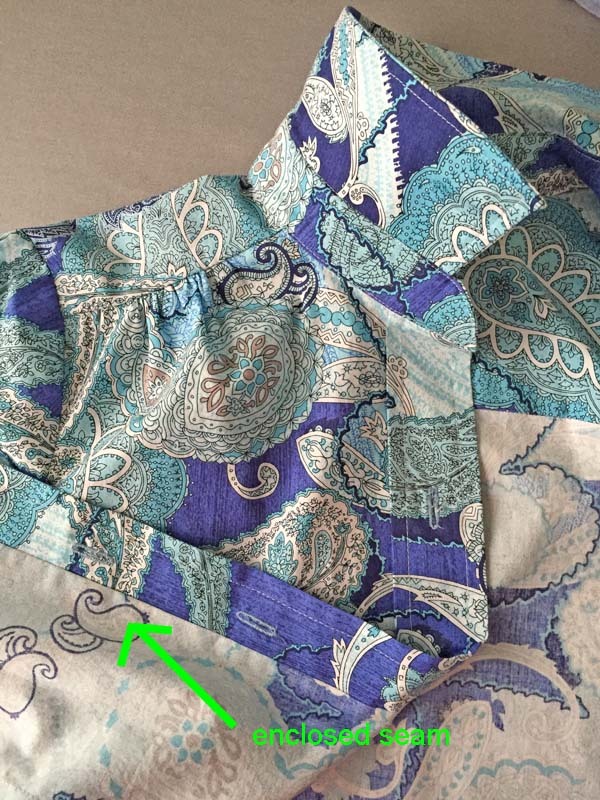 Some fitting details on that pattern in this post . I wonder if it is roomy because it is a Palmer and Pletsch for McCalls pattern, and those patterns are designed for fitting adjustments. Don't get me wrong, their patterns are sometimes a bit frumpy on the envelope but actually quite good and even though they require going through the fitting steps (for most people) the result is a nice. Anyway, I was expecting McCalls roominess in the neck and shoulders and this pattern is not like that. At all! No wiggle room, and I was lucky that it fit but it is not at all like a typical Big 4 t-shirt pattern, at least to my experience. Also I cut it out with an extra inch down the full length of the side seams front and back because I like to fit on the fly. I ended up taking away most all of that above the waist and keeping it around the hips but that is my typical pattern adjustment. I saw a review that the top came out too small for the person who sewed it, and it very clearly states the finished bust measurement is less than the pattern size bust measure by about an inch. So that is negative ease, people. Beware! If your knit is not very stretchy or you don't want the super clingy look then adjust accordingly. For a t-shirt I don't like things to be super tight, so you might think my version looks too loose but I prefer it that way. And ignore the fit on the dress form - that thing has no hips whatsoever. The side seam gathers could not be easier, just a piece of elastic sewn on the side seam. I actually used their elastic guide and it was perfect. another plus for this pattern. Final note - completely construction on my regular machine, straight stitch. I am just not a serger sewer - only for seam finishing. Although I would like to have the machine that sews the knit hems, is that the coverstitch? but in the scheme of things not really important. Another look, and a few tulips in the background. 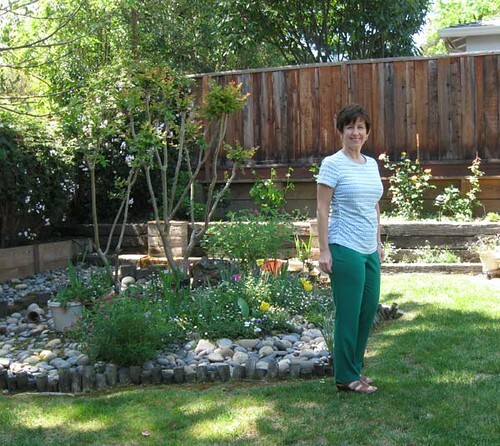 Plus the sad drought-stricken lawn. We have to save our water for important things around here - like the swimming pool. Does that sound awful? but hey, California, what are you going to do? Also I just finished another t-shirt and and I am putting the cuffs on a woven shirt so it is the season of tops. Happy weekend sewing, and I hope things are starting to look like spring for everyone. What, April already? So trite to say but this year is flying by. I am kind of flitting around in my sewing projects, nothing much planned and that is fine by me. It impresses me when people do a big seasonal planning of their sewing, or a wardrobe revamp, or deep analysis of what they want to have. Not me, I just sew up whatever strikes my fancy. Once in a while I decide I need something particular, like a dressy winter coat, or maybe an outfit for a certain occasion, but for the most part I just finish one project and look around to see what can come next. 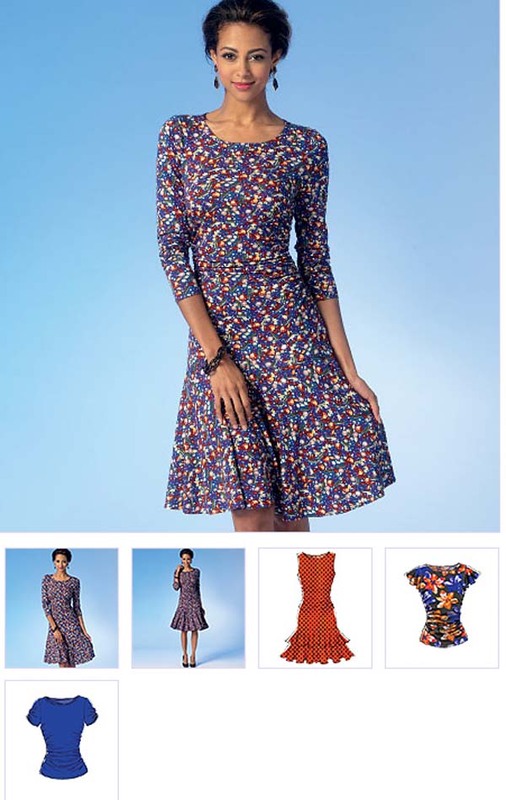 What has come next was a pattern that I have had for a long time, I even recommended it in my Pattern Whisperer post for daytime and work dresses, which is New Look 6097. Sewn up by a lot of people to great success. I am still on the fence for my version, entirely due to fabric choice. About every two years I sew something using ITY knit and so far have never liked it. Must remember to skip the poly knits! Is ITY knit always polyester? Seems like. I really love rayon jersey so I will stick with that for the future. Anyway - here are my version(s) of that New Look pattern. I started with long sleeves - decided that was a mistake, went for short, decided that looked dowdy, tried much shorter sleeves, still not working. Took off the sleeves and liked it better. The final version will have another change and I might get to that this weekend. Mostly it is down to fabric choice - kind of a "what was I thinking" selection. Was on super sale at Joann's so cost about $ 12 - and I had that very nice matching belt already. I love the blues but it is just not doing it for me. Maybe when finished and it is a nice warm spring day I will like it :) Stay tuned. My friend Michelle had a birthday recently and I generally sew something for her. As mentioned before she is just about the same size as me so it is a "cut and sew" operation to make something for her. I decided that a floaty tunic top would be different as I have made knit dresses and a knit top previously. 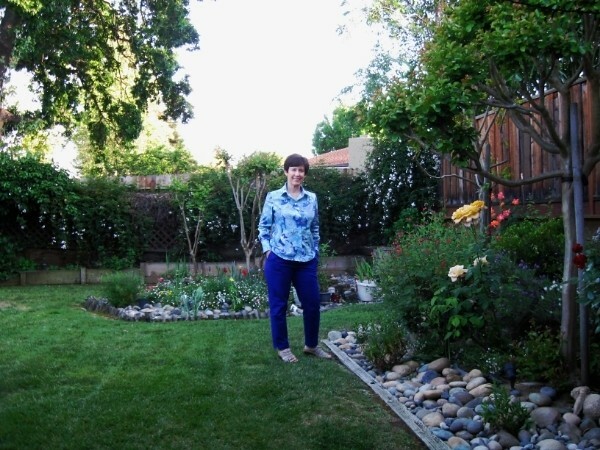 I used the pattern I designed last summer when I made a tunic top for myself. Which I am very much looking forward to wearing again since the weather is warming - I only wore that once last year in Hawaii before autumn. I had thought about putting a contrast fabric on the yoke but everything I tried looked odd, so I used the self fabric and added trim which is soutache braid (red) and bias tape turned into piping (white). Have you ever used that soutache braid before? It is really fun to work with, and I have to say kind of easy. It behaves well and steamed into place for curves or corners. 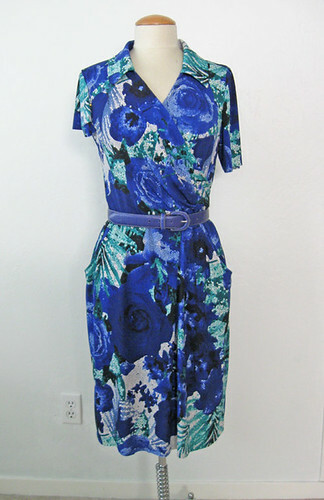 I first used it when I made this vintage dress - also red! 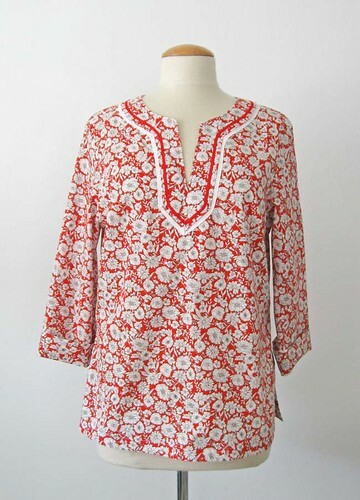 The fabric for this tunic top is a lovely cotton voile I found at Stone Mountain. Sewing lessons - or more accurately sewing instruction. I get questions about my sewing "classes" so I thought I would just write a few words about what I do. It usually starts with someone emailing me after reading here and asking how it all works. It starts with the individual and what they want in terms of sewing instruction. I don't teach a specific class, we just schedule a day or days and I teach whatever you want to learn. Here are a few typical scenarios. Fit a basic pattern. 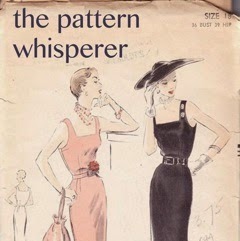 We would talk beforehand about fit issues, what might be previous issues with fit or what makes a good dress pattern. 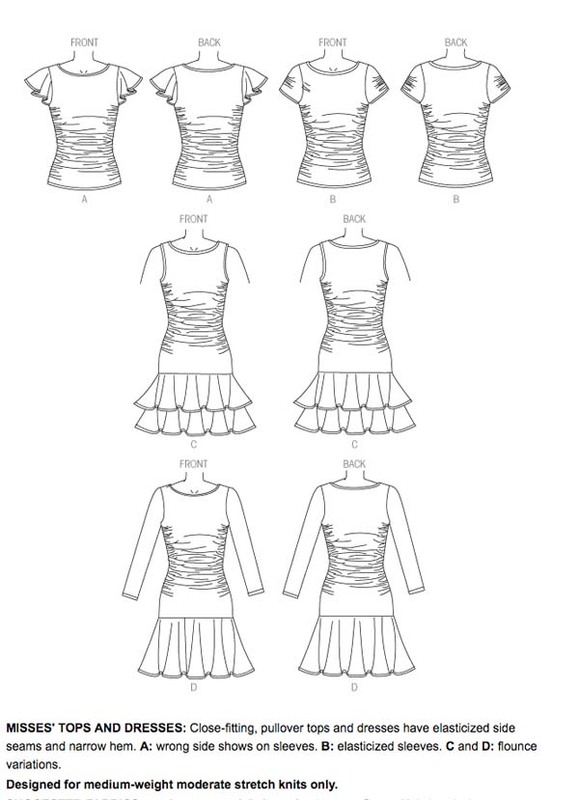 I suggest some basic dress or other patterns that we can choose from, we take measurements, look at the pattern, do some flat pattern fitting adjustments, cut out and sew up a muslin, adjust that muslin, then transfer the adjusted muslin back to the paper pattern. At this point we are usually exhausted :) That is a full day usually, and at that point my suggestion is to for the student to make a second muslin at home to see how all the changes fit - usually quite well. This same process applies for anything else, like a jacket, shirt, skirt etc (but I confess not pants, just not my area). Technique: it can be anything from cutting out and marking a pattern to how to get a perfect lapel. I love the technical side of sewing but the majority of my students have be interested in fitting - no surprise there as it is something we all deal with. How and where to use all the different interfacings, and why. How to press and what tools are helpful. Zippers, buttonholes and my favorite: welt pockets. Pattern and fabric: Sometimes we have spent an hour analyzing patterns and discussing why certain patterns might be better for one figure or another, which patterns are good for various levels whether beginner, intermediate or advanced. Why certain patterns are more simple to fit and adjust than others. What about ease? is it a conspiracy put over by the pattern companies? Answer: no. What size to start with? that is a good one and just like bras many people are starting with the wrong size. I love it when someone brings a bag of patterns and garments so I can see what has been going on in their sewing room and hopefully give some suggestions or ideas for their next projects. So those are some of the things I have covered in teaching sewing during these past few years. Plus lots of sewing talk - since we now are all connected via the sewing web and have all kind of friends in common - even though most of them we have never met in person! 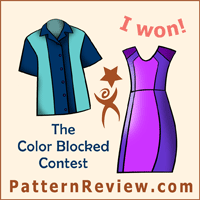 Up next, finish that dress, I completed a couple of cute t-shirts which I will show soon, including McCalls 7046 which I just might have to repeat in the sassy dress version. 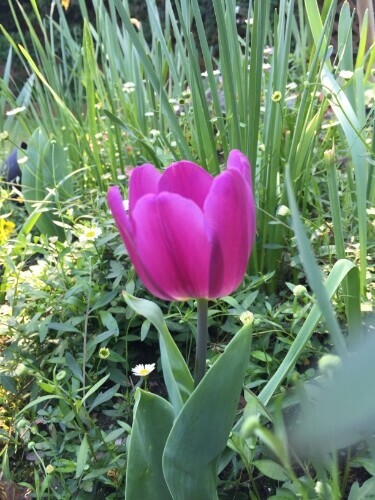 today's garden photo, one of the first tulips.